This light and crispy salad is a delicious way to add more vegetables to your day and is packed with flavor. Savory, crunchy and a bit tangy, this prosciutto salad is a dish that’s suitable to serve year-round and is easy to pull together in as little as 15 minutes. Serve alongside grilled or roasted meats or as a part of a larger antipasti selection. 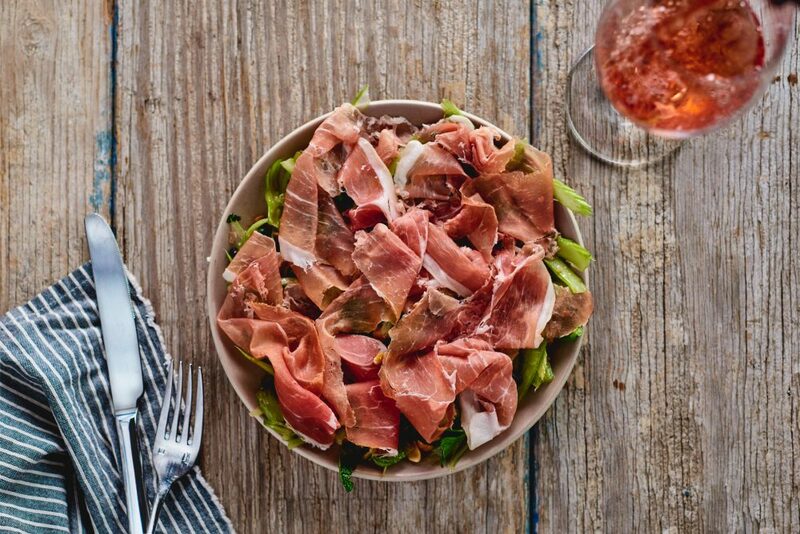 The refreshing greens in this prosciutto salad make it a delicious treat that’s sure to become an instant favorite. Serve with a light wheat beer, or take a look at some of our suggested Prosciutto di Parma beer pairings. This recipe comes from our Specialist Chef Joshua McFadden of Ava Gene’s in Portland, Oregon. Photo credit: Ashley Marti. Slice celery and let soak in ice water for 10 minutes for an extra crunchy texture, dry thoroughly. In a large bowl, toss in celery, roasted and rough-chopped peanuts and currants. Toss with red wine vinegar or lemon juice and season with salt, cracked black pepper and red chili flakes. Drizzle with extra virgin olive oil and toss. Top with thinly-sliced Prosciutto di Parma and serve.